How Long Can You Expect a CEREC Crown to Last? Remember the old days when getting a crown seemed to take forever? Your dentist had to prepare your tooth and take an impression of it. Then, you had to deal with a temporary crown for weeks while you waited for a laboratory to create your custom restoration. Thanks to CEREC in Lynnfield, those days are long gone! This amazing technology enables you to get a beautiful, custom crown in just a single dental appointment. But how long can you expect a CEREC crown to last? Some people assume that because CEREC crowns take such a short time to create, they present a lower quality product that crowns that take longer. That is a misperception. 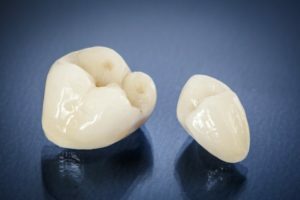 CEREC crowns are made by a highly intelligent machine that uses its own milling unit to craft tooth restorations out of a single block of porcelain. The result is a beautiful, custom, and high quality crown or bridge that is just as tough as anything you would have had to wait longer for. On average, CEREC porcelain crowns last for 10 – 15 years, though exactly how long your crown will last depends on a number of factors. For example, if you grind your teeth, that can cause premature wear on your crown and lead to the need for early replacement. On the other hand, if you take good care of your teeth and no accidents happen that affect your smile, it’s possible that the crown will last much longer than 15 years. If it’s been a number of years since you got your crown, or you’ve noticed changes in the way your crown feels, it’s a good idea to head to your dentist in Lynnfield. They can take a look at your restoration and let you know if all is well or if you need to get the crown replaced. There is decay beneath the crown. This might happen if your gums recede, exposing the tooth root and leaving it vulnerable to cavities. Your old crown is broken or chipped. This may occur if you accidentally bite something hard or take a blow to your face. A crown comes off. Sometimes, your dentist may be able to reattach the crown. In other cases, you’ll need a replacement. Of course, you may simply want rather than need a new crown. This is true for many people who have old, ugly metal restorations. Because CEREC crowns are made of porcelain, they look like natural teeth and make a lovely addition to your smile. CEREC crowns are tough enough to stand the test of time! If you’d like to know more about this remarkable technology, your dentist would be happy to help you. Dr. Rob Schumacher takes pride in restoring his patients smiles quickly and expertly. If you suspect that you need a new CEREC crown, please feel free to contact our office at 781-334-3400. Comments Off on How Long Can You Expect a CEREC Crown to Last?